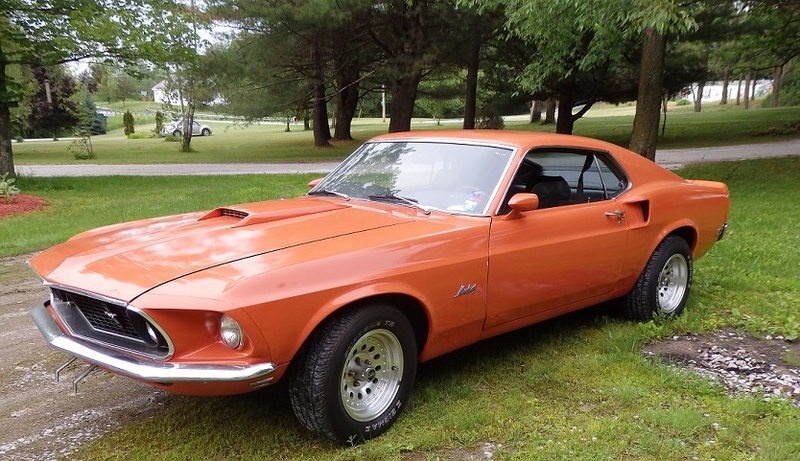 While searching the New Jersey Craigslist for Limited Edition 600 Mustangs like Groovy Green I came across this car, a 1969 Mustang 4.1 Litre Special, which was part of a promotion in the Indianapolis area during the same timeframe as the Limited Edition 600 promotion. I quickly contacted the seller and put a deposit on it the same day. The following weekend I drove down to New Jersey and hauled it home. Please note that it is not wearing the correct shade of orange that it left the factory in. 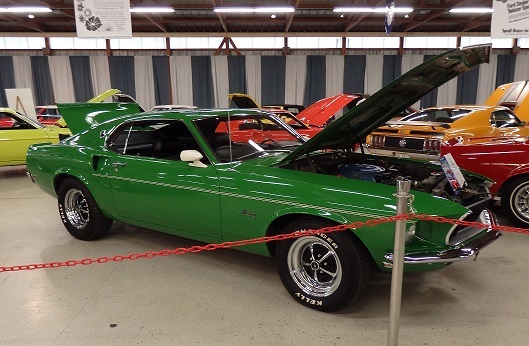 I've been searching for other special order color 1969 Mustangs online since I bought Groovy Green back in 2004. It just so happens that I had actually located the same 4.1 Litre Special up for auction on Ebay in January 2005 and kept the pictures (see below). Back then it was in Indiana and was wearing the correct color orange and black mirrors, though it had been repainted in 1999. From the pictures in 2005, it appeared to still had its buck tag. But by 2014 it was broken off the car with only a partial VIN and no paint code showing. Back in 2005 the 4.1 Litre Special promotion was not heard of, so I thought I was looking at just another special order color car. Not a special promotional car. 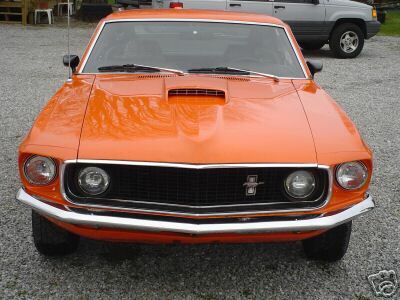 Here is the only other 4.1 Litre Special that has ever surfaced to my knowledge. The first owner bought it before it even came off the car carrier and it is still wearing its original WT7034 paint! I was lucky enough to be parked next to it at the Special Edition's Mustang display at Carlise, PA in June 2014. My car can be seen behind it. It is now owned by, Don Sheldon,the son of the original owner. Don was gracious enough to let me take a ton of pictures of it and all of the original documenation. The only changes he made were adding the Magnum 500 wheels, adding dual exhaust and adding power steering. The rest is all factory original! It is rumored that these cars came with a fender emblem that read "4.1 Litre" in red and a black bar that read "Special". However, Don's car never had the emblem and none have ever been documented that I have been able to find. Very little is known about the 4.1 Litre Special promotion. It is known, thanks to Kevin Marti of Marti Auto Works, that 150 cars were produced for the Indiania district under 6 different DSO#s (460569 - 460574). DSO#s (460569, 46070 & 460571) were coupes and DSO#s (460572, 46073 & 460574) were fastbacks. The cars were produced in 3 different colors, Green (WT7034), Orange (WT5108) and Yellow (WT# unknown). 25 cars were produced under each DSO# with each car under each DSO# being painted the same color. 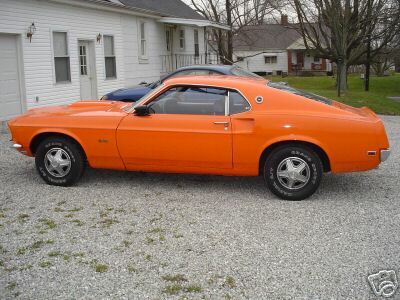 Therefore my car is 1 of 25 fastbacks to be produced in this color. It should be noted that Green (WT7034) was also used on the Rainbow of Colors promotion, but Orange (WT5108) was not. Until one of the yellow cars surfaces, it will not be known if it used a Rainbow of Colors promotion color or not. My car was produced under DSO#46074 and Don's was produced under DSO#46072. So we may assume that DSO#46073 was for the Yellow fastbacks. Dual Sports Mirrors (black on the orange cars, white on the green cars, yellow is unknown). This promotion was very similar to the Limited Editon 600 promotion, but the Limited Editon 600 promotion included a broader engine selection (200-1V, 250-1V, 302-2V and 1 special 351-2V) and other low cost options (such as trunk light, parking light, etc) that appeared randomly on the 508 cars that were produced. I have other projects to get done, so it will be some time before you will see more on this car. I will update this page with information on the 4.1 Litre Special as it is uncovered. CJM 11/03/2015.